I know there are times, one of those days that something or somebody gets into your nerves and you get a little bit annoyed, ok  alright and do you remember one of those bad occasions when you latterly felt like exploding. Yeah I feel you. I have had my share of that too. That is when I have learned to turn to my "favorite jokes about friends and friendship" or any other family friendly funny clean short jokes to kind of uplift my spirit and defuse any ticking time bomb of anger that may be brewing inside of me. Its a technique that works so well not just for me but other people I know. I truly believe this simple technique can also help you cool down instead of doing something stupid that you may end up regretting for the rest of your life. Whoever said that "laughter is the best medicine" knew exactly what they were talking about. For example below is a funny joke about former President George and Laura Bush. George and Laura Bush take a vacation to Crawford and decide to go the grocery store. In the checkout line, Laura recognizes the man working at the register as an old high school boyfriend. Laura rolls her eyes and says, No. Id be married to the President of the United States. Before we go dive in and laugh like crazy, there a couple of thing we need to address first concerning the jokes you will find on this page. Hopefully that will put us on the same perspective as far as humor is concerned. 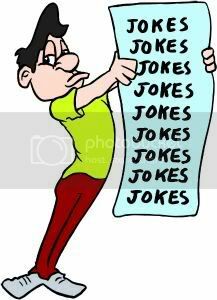 The dictionary describes humor as the tendency of particular experiences to provoke laughter or provide amusement. This description though accurate regulates humor to something that seems so cut and dried and rather well, humorless. Humor itself goes far beyond a simple definition of our ability to laugh and to see the lighter side of any given situation. Humor and laughter provide a wealth of benefits for our mind, body and souls. It is because laughter and humor is one of the things that makes us uniquely human. It paves the way for friendship and love and can lighten even the darkest mood. It is perhaps, the most precious and free gift in life. Three brothers are sitting at the bar in a Moscow establishment. An older man is sitting at a table behind them and has obviously had too much vodka. He stands, walks up to the first brother and says,Your mother is a vicious, greedy woman! The brother tells him to shut up and go sit down. After about 5 minutes, the old man stands and walks up to the second brother, I sleep with your mother whenever I want! Disgusted, the brother tells the old man to bugger off. A few minutes later, the old man stands and starts walking towards the third brother. How about you submit your funny Russian jokes about friends by clicking here! Although laughter has many told and untold benefits here are five benefits that you may not have considered. 1.) Laughter is the tie that binds. Laughter is something that is shared. When you share a laugh with someone it changes your relationship with them. Laughter can cement a friendship, help you to fall in love, or simply let you feel closer to someone. There is nothing like laughter to make people feel closer to one another. Studies show that marriages in which the partners share laughter on a regular basis are less likely to end in divorce and are happier than those marriages where the couple seldom laughs together. 2.) Laughter makes you attractive. In today's world where physical attraction is sought after by millions of people, there is one free thing that can make you more attractive to those around you and that is the ability to laugh. People see those around them who laugh frequently as more friendly and attractive and they seek to be around those people simply because being with people who have a great sense of humor makes them feel good. 3.) Laughter can reduce both physical and emotional stress and lower your blood pressure. Tests have proven that sharing a deep belly laugh can lower your stress levels and get rid of held in anger and actually relax those knotted muscles. People who have enjoyed a good laugh feel more relaxed physically for up to 45 minutes afterward. Call one of your best friends and try it out. "Why not start by sharing old time jokes about friends!" You will be amazed and suprised by how good and relaxed you all feel afterwards. 4.) Humor strengthens the immune system. For years people have been saying that laughter is the best medicine. When it comes to your immune system this is certainly true. Laughing raises the levels of infection fighting cells in your body making it easy to fight for illnesses and infections. Jokes about friends can result in a real good laugh, consequently a good hardy chuckle helps in the release of endorphins which are natural pain killers that contribute to our general sense of well being. Also, as noted before humor lowers your stress level and high levels of stress can weaken the immune system. 5.) Laughter gives us a more positive outlook on life. Let's face it, the ability to laugh at ourselves and the world around us give us a more positive outlook on life. Having a more positive outlook allows us to accomplish our goals, can ease challenges and will often change our perspective about life in general. Without laughter life would be very boring indeed. While it seems like some people are just generally more happy than others and laughter comes easier to these people everyone can have more laughter in their lives. It is simply a matter of wanting to make the changes that will allow that side of you to shine through. Try surrounding yourself with people who laugh a great deal. Laughter is contagious and when you are around people who laugh you can't help but smile at the this pure joyful sound. Before you know it you will find yourself laughing right along with them. Try a tickle session with your partner. Tickling is one great way to instigate laughter and will draw you and your partner closer together. Chances are if you instigate a tickling session then your partner will reciprocate and soon you will both feeling more relaxed and closer than ever before. Watching funny movies, listening to all sorts of jokes, or even exchanging jokes about friends over the internet are all great ways to get you started on the road to laughter. Taking someone else along for the ride, makes the laughter more contagious and will result in a happy feeling. Actively search for things that make you laugh. "Yes. You are in a hot air balloon, hovering approximately 30 feet above this field. You are between 40 and 42 degrees N. latitude, and between 58 and 60 degrees W. longitude." "Well", says the man, "you don't know where you are, or where you are going. You have made a promise which you have no idea how to keep, and you expect me to solve your problem. The fact is you are in the exact same position you were in before we met, but now it is somehow my fault. Have A Great Joke About Friends, Friendship or for Friends? Do you have a great joke about friends, friendship or for friends? Why not Share it!